Mercurii, 3 die Novembris, 1680. A MESSAGE from the Lords, by Mr. Justice Wyndham, and Mr. Baron Atkins. Mr. Speaker, The Lords have commanded us to acquaint you, That they have passed a Bill, intituled, An Act for the better Regulating the Tryals of the Peers of England: To which they desire the Concurrence of this House. A Petition of the Inhabitants of the City of Rochester was read. A Petition of Lionel Anderson, a Popish Priest convict, in Newgate, was read. Ordered, That Sir Robert Clayton, Mr. Harbord, Sir Gilbert Gerrard, Mr. Hamden, and Mr. Lucy, do repair to Newgate; and do take the Examination of the said Lionel Anderson. An ingrossed Bill, sent from the Lords, intituled, An Act for the better Regulating the Tryals of the Peers of England, was read the First time. Resolved, That the Bill be read a Second time on Monday Morning next, after Ten of the Clock. A Petition of the Burgesses of East Grimstead in the County of Sussex, was read. A Petition of Bernard Grenvile and Nicolas Courtney Esquires, touching the Election of Saltashe, was read. Ordered, That the Committee appointed to prepare the Bill for regulating the Elections of Members to serve in Parliament, do present the said Bill to the House To-morrow Morning. Ordered, That Mr. Harnage be continued in Custody of the Serjeant at Arms attending this House, during the Pleasure of the House. Ordered, That the Committee appointed to inspect the Journals of the Two last Parliaments, relating to the horrid Popish Plot, do look into, and make Report of, the Impeachments exhibited, in the Two last Parliaments, against the Lords in the Tower; and of the Proceedings thereupon: And the said Committee is to inquire into, and prepare, Evidence against the said Lords. A Petition of Ferdinando Hudleston Esquire, touching the Election of Cumberland, was read. Ordered, That the said Petition be referred to the Consideration of the Committee of Elections and Privileges; to examine the Matter thereof, and to report the same, with their Opinion therein, to the House. Ordered, That the Papers delivered in by the Clerk of the House of Lords, relating to Mr. Bedloe's Evidence, taken by the Lord Chief Justice North; and also the Paper given in by Sir John Knight; be sealed up, and lodged in the Hands of Mr. Speaker. 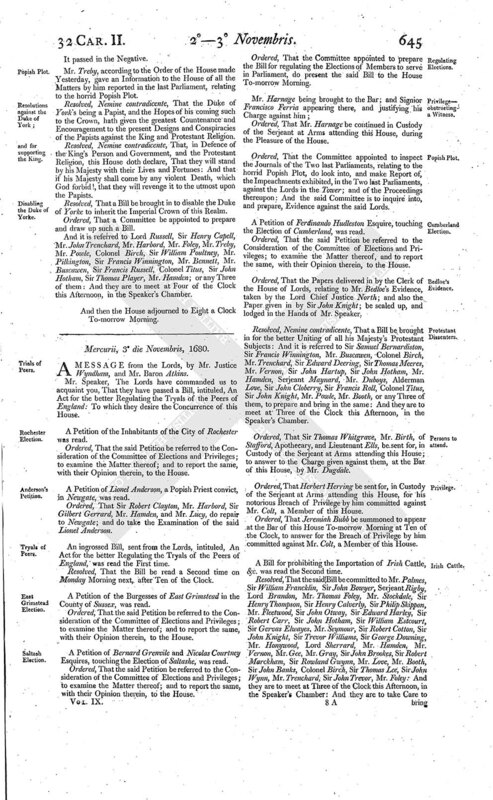 Resolved, Nemine contradicente, That a Bill be brought in for the better Uniting of all his Majesty's Protestant Subjects: And it is referred to sir Samuel Bernardiston, Sir Francis Winnington, Mr. Buscawen, Colonel Birch, Mr. Trenchard, Sir Edward Deering, Sir Thomas Meeres, Mr. Vernon, Sir John Hartup, Sir John Hotham, Mr. Hamden, Serjeant Maynard, Mr. Duboys, Alderman Love, Sir John Cloberry, Sir Francis Roll, Colonel Titus, Sir John Knight, Mr. Powle, Mr. Booth, or any Three of them, to prepare and bring in the same: And they are to meet at Three of the Clock this Afternoon, in the Speaker's Chamber. Ordered, That Sir Thomas Whitgrave, Mr. Birth, of Stafford, Apothecary, and Lieutenant Ells, be sent for, in Custody of the Serjeant at Arms attending this House; to answer to the Charge given against them, at the Bar of this House, by Mr. Dugdale. Ordered, That Herbert Herring be sent for, in Custody of the Serjeant at Arms attending this House, for his notorious Breach of Privilege by him committed against Mr. Colt, a Member of this House. Ordered, That Jeremiah Bubb be summoned to appear at the Bar of this House To-morrow Morning at Ten of the Clock, to answer for the Breach of Privilege by him committed against Mr. Colt, a Member of this House. A Bill for prohibiting the Importation of Irish Cattle, &c. was read the Second time. 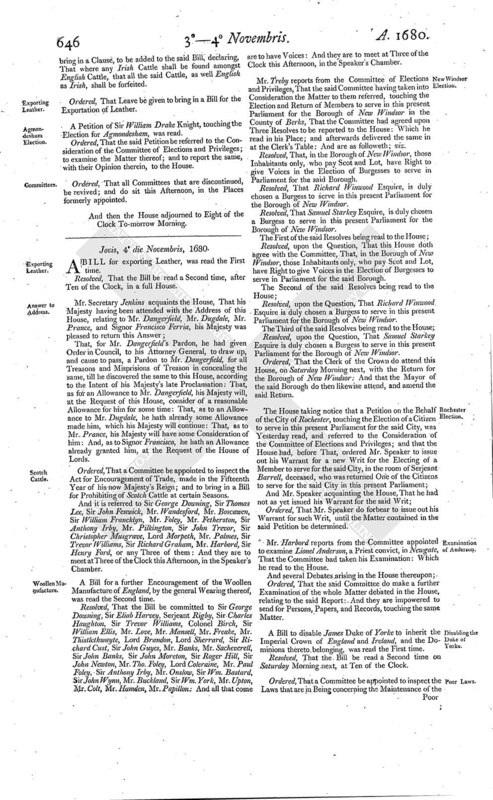 Resolved, That the said Bill be committed to Mr. Palmes, Sir William Francklin, Sir John Bowyer, Serjeant Rigby, Lord Brandon, Mr. Thomas Foley, Mr. Stockdale, Sir Henry Thompson, Sir Henry Calverly, Sir Philip Skippon, Mr. Fleetwood, Sir John Otway, Sir Edward Harley, Sir Robert Carr, Sir John Hotham, Sir William Estcourt, Sir Gervas Elwayes, Mr. Seymour, Sir Robert Cotton, Sir John Knight, Sir Trevor Williams, Sir George Downing, Mr. Honywood, Lord Sherrard, Mr. Hamden, Mr. Vernon, Mr. Gee, Mr. Gray, Sir John Brookes, Sir Robert Marckham, Sir Rowland Gwynn, Mr. Love, Mr. Booth, Sir John Banks, Colonel Birch, Sir Thomas Lee, Sir John Wynn, Mr. Trenchard, Sir John Trevor, Mr. Foley: And they are to meet at Three of the Clock this Afternoon, in the Speaker's Chamber: And they are to take Care to bring in a Clause, to be added to the said Bill, declaring, That where any Irish Cattle shall be found amongst English Cattle, that all the said Cattle, as well English as Irish, shall be forfeited. Ordered, That Leave be given to bring in a Bill for the Exportation of Leather. A Petition of Sir William Drake Knight, touching the Election for Agmondesham, was read.